Why Do Trees Turn Colors? Most of us remember chlorophyll from science class, as the chemical that makes leaves green. But ask why leaves turn color in the fall, and we get vague quickly. Colder temperatures? Shorter days? True, but there’s more to the story. 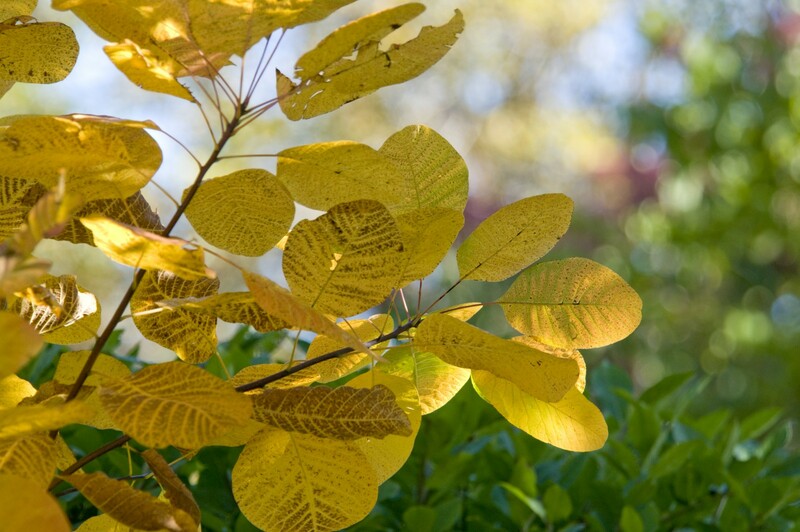 American smoke tree (Cotinus obovatus) turns a brilliant yellow late in the season—after it has gone through burgundy and bright red. A summer leaf, full of chlorophyll, looks green. But once chlorophyll production stops in fall, the colors overwhelmed by green are revealed: yellow, orange, or brown, the colors of carotenoid chemicals. Reds, crimsons, and purples happen when sugar is trapped in the leaves. As sugar decomposes, it creates chemicals called anthocyanins. Other factors come into play too: nighttime temperatures, soil moisture, the tree’s own genetics, and, of course, the weather. A warm and dry September has meant a late start for color this year. Don’t miss a chance to see the full palette of fall color happening now at the Chicago Botanic Garden—take a fall walk or use our virtual guide: our Garden Guide app. 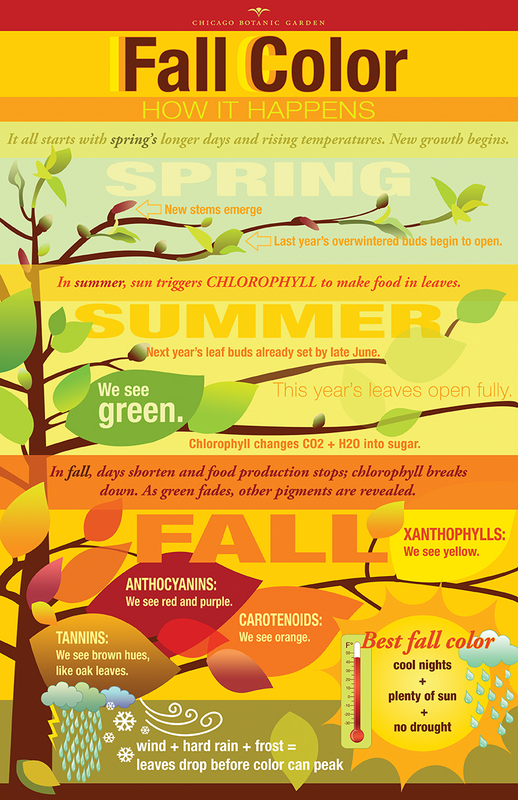 Check out our infographic below for the full fall story in living color. Posted on October 14, 2015 Author The Graphic GardenersCategories InfographicsTags fall colors 2015, fall leaves schedule, leaves changing Illinois, trees changing colorsLeave a comment on Why Do Trees Turn Colors?